You know, Religion and I aren't on the best of terms. But this kind of ice cream? It's the kind that could make a girl a believer! 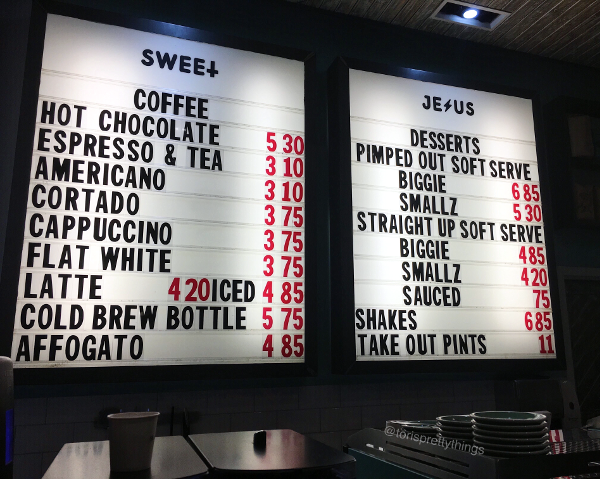 If you're looking for high-quality soft serve, that embraces that over-the-top ice cream trend, then look no further than Sweet Jesus in Downtown Toronto. On my first go, I tried the Oh Sweet Baby Jesus! cone. They were out of caramel soft serve that night, so I chose a mixture of chocolate soft serve with the usual cover of peanut butter and caramel goodness. But what really get's me is their soft serve. Oh Em Gee, is it good! 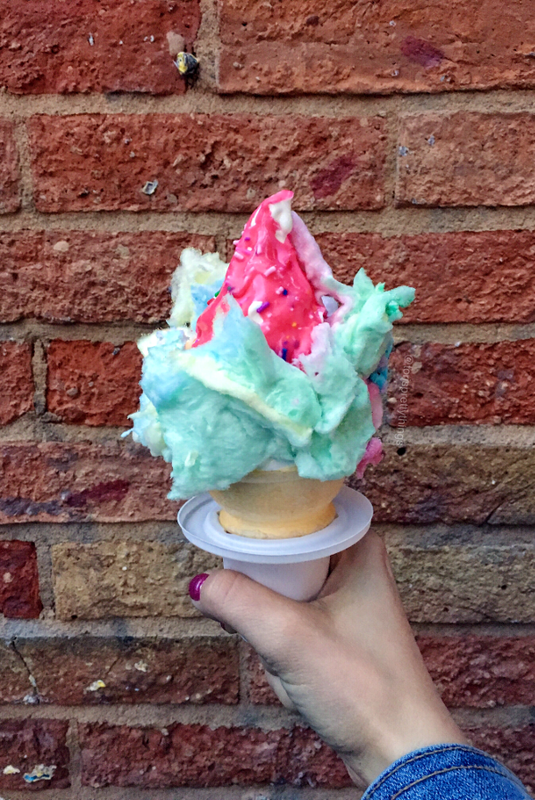 As a ride-or-die hard ice cream fan, this is the best soft-serve ice cream I've ever had! It's creamy and rich like a custard, but still soft enough in texture to be soft-serve ice cream. I really wasn't sure what to make of this place. Most of the Yelp reviews have a common theme: Over-hyped. I'm not really one for bandwagons (I mean, I chose the Mets as my baseball team during the height of the Yankee dynasty...) and yes, there's a tonnn of hype about this place. When close friends stayed with us a few weeks back, we decided to just give it a go. I have no idea what ice cream those naysayers tried because Sweet Jesus is bomb! The lines are almost always out the door, and sometimes around the corner, so try to stop by on a weeknight or an off-time. But their ice cream is worth the wait, worth the effort ,and worth the cheat meal. 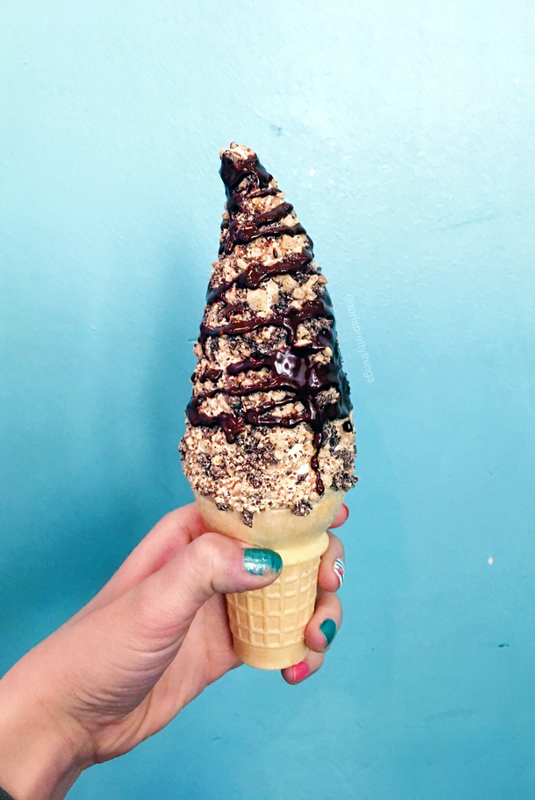 I certainly plan on burning a few extra calories on that treadmill this summer to earn another Sweet Jesus cone.